The most important feature of the negotiable instrument is that it can be freely transferred, which is possible in two ways, i.e. 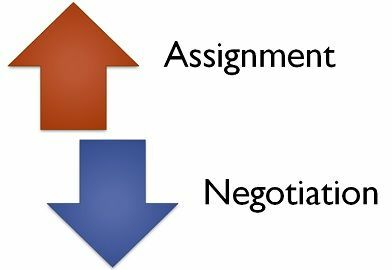 negotiation and assignment. Negotiation implies the transfer of negotiable instrument, that takes place in order to make the transferee, the holder of the instrument. On the other hand, assignment alludes to the transfer of ownership of the negotiable instrument, in which the assignee gets the right to receive the amount due on the instrument from the prior parties. The most important difference between negotiation and assignment is that they are governed by different acts. To know more differences amidst the two types of transfers, take a read of the article below. Meaning Negotiation refers to the transfer of the negotiable instrument, by a person to another to make that person the holder of it. Assignment implies the transfer of rights, by a person to another, for the purpose of receiving the debt payment. Effected by Mere delivery in case of bearer instrument and, endorsement and delivery in case of order instrument. A written document duly signed by the transferor. Title Transferee gets the right of holder in due course. Assignee's title is subject to the title of Assignor. Transfer notice Not required Must be served by assignee on his debtor. Right to sue The transferee has the right to sue the third party, in his/her own name. The assignee has no right to sue the third party in his/her own name. Negotiation can be described as the process in which the transfer of negotiable instrument, is made to any person, in order to make that person, the holder of the negotiable instrument. Therefore the negotiable instrument aims at transferring the title of the instrument to the transferee. By delivery: Negotiation is possible by mere delivery, in the case of bearer instrument, but that should be voluntary in nature. By endorsement and delivery: In the case of order instrument, there must be endorsement and delivery of the negotiable instrument. The delivery must be voluntary, with an intention of transferring the underlying asset, to the transferee to complete the negotiation. By the term assignment we mean, the transfer of contractual rights, ownership of property or interest, by a person, in order to realise the debt. An assignment is a written transfer of rights or property, in which the assignor transfers the instrument to assignee with the aim of conferring the right on the assignee, by signing an agreement called assignment deed. Thus, the assignee is entitled to receive the amount due on the negotiable instrument, from the liable parties. The transfer of the negotiable instrument, by a person to another to make that person the holder of it, is known as negotiation. The transfer of rights, by a person to another, for the purpose of receiving the debt payment, is known as assignment. When it comes to regulation of negotiable instrument, negotiation governs the Negotiable Instrument, 1881, while the assignment is regulated by Transfer of Property Act, 1882. Negotiation can be effected by mere delivery in case of bearer instrument and, endorsement and delivery in case of order instrument. In the case of bearer instrument, the negotiation is done by mere delivery of the instrument, but in the case of bearer instrument, endorsement and delivery of the instrument must be effected. Conversely, the assignment is effected by written agreement to be signed by the transferor, both in the case of order and bearer instrument. In negotiation, the consideration is presumed, whereas, in the case of assignment, the consideration is proved. There is no requirement of transfer notice, in negotiation. On the contrary, notice of assignment is compulsory, so as to bind the debtor. In negotiation, the transferee has the right to sue the third party in his/her own name. As against, in the assignment, the assignee does not have any right to sue the third party, in his/her own name. In negotiation, there is no requirement of payment of stamp duty. Unlike, in the assignment, stamp duty must be paid. In negotiation, the transfer of negotiable instrument, entitles the transferor, the right of a holder in due course. On the other extreme, in the assignment the title of the assignee, is a bit defective one, as it is subject to the title of assignor of the right.